Not to be confused with Irina Slutsky. 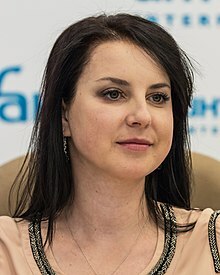 Irina Eduardovna Slutskaya (Russian: Ири́на Эдуа́рдовна Слу́цкая (listen) (help·info); born 9 February 1979) is a Russian former figure skater. She is a two-time World champion (2002, 2005), two-time Olympic medalist (silver in 2002, bronze in 2006), seven-time European champion (1996, 1997, 2000, 2001, 2003, 2005, 2006), a four-time Grand Prix Final champion (2000–2002, 2005) and a four-time Russian national champion (2000–2002, 2005). She won a record total of 17 titles on the Grand Prix circuit. Slutskaya, known for her athletic ability, was the first female skater to land a triple lutz-triple loop combination. She is also known for her trademark double Biellmann spin with a foot change, which she also invented. With her women's record seven European titles she is generally considered to be one of the most successful ladies' singles skaters in Russian history. Slutskaya started skating at the age of four, encouraged by her mother. Coached by Zhanna Gromova from the age of six, she first made her mark as a promising junior skater by winning the bronze medal at the 1994 World Junior Championships, held in December 1993 in Colorado Springs. This would be the beginning of a twelve-year rivalry with American legend Michelle Kwan, who won gold at this same event. In the 1994–95 season, Slutskaya continued her rise; after winning the 1995 World Junior title in November 1994 in Budapest, she took bronze at 1995 Russian Championships to qualify for her first senior ISU Championship. At the 1995 European Championships, she came back from a fall in the short program to skate the third best free skating and rose to fifth overall. She qualified for Worlds along with silver medalist Olga Markova, by finishing ahead of Russian champion Maria Butyrskaya (7th). At the 1995 World Championships, Slutskaya again fell in the short program but performed six triples in the next segment, finishing 5th in the free skating and 7th overall. In the 1995–96 season, Slutskaya competed in the inaugural edition of the Champions Series (later renamed the ISU Grand Prix of Figure Skating), taking bronze at the 1995 Skate America and placing fourth at the 1995 Trophée de France. In January 1996, at the European Championships in Sofia, Bulgaria, she became the first Russian woman to win the European title, performing six triples in the free skating to dethrone the five-time defending champion Surya Bonaly. Slutskaya also won the Centennial on Ice, combining with Butyrskaya to hand Kwan her only defeat of the season. At the Champions Series Final, held in Paris in late February 1996, she finished ahead of reigning World champion Chen Lu (4th) and took the silver medal behind Michelle Kwan. In March, she competed at the 1996 World Championships in Edmonton, Canada. Third in the short program, she held onto her position in the next segment after recovering from an early fall to complete six triples. She was awarded the bronze medal and stepped onto her first World podium, alongside Kwan (gold medalist) and Chen (silver). In 1996–97, Slutskaya began her season by winning her first Champions Series title at the 1996 Skate Canada International, beating rising star Tara Lipinski. She went on to win two more CS events, the 1996 Nations Cup and 1996 Cup of Russia. In January 1997, she repeated as the European champion, landing seven triples (one with a slightly flawed landing). By the Champions Series Final, held in late February and early March 1997, Slutskaya was struggling with jumps and finished third behind Lipinski, the new U.S champion, and Kwan. At the 1997 World Championships in Lausanne, a missed combination left her in 6th place in the short program. She then incurred a back injury from a hard fall in practice the day of the free skating. In the free skating, she completed six triples, including a 3S-3Lo combination, and received three first-place votes for the segment. Due to the short program, she finished fourth overall. In the 1997–98 season, Slutskaya took silver at the 1997 Nations Cup and gold at the 1997 Cup of Russia. In December, she finished off the podium at the Russian Championships and at the Champions Series Final in Munich before winning the silver medal in January 1998 at the European Championships in Milan. In February, she competed at her first Winter Olympics in Nagano, Japan. Ranked fifth in the short program after her planned combination became a 2Lz-2T, Slutskaya performed five triples in the free skating and received two third-place votes (from the U.S. and Hungary) but placed fifth in the segment and overall. The next month, she won silver at the 1998 World Championships, coming back from a fall in the short program and successfully landing two triple-triple combinations in the free skating. During the 1998–99 season, Slutskaya won a silver and two bronze medals on the Grand Prix series to qualify for her fourth Final. In January 1999, she placed fourth at the 1999 Russian Championships, leading to her omission from the Russian teams to the European and World Championships. She took bronze behind Tatiana Malinina and Butyrskaya at the Grand Prix Final, held in Saint Petersburg in March 1999. Slutskaya then considered leaving competition but decided to continue. Slutskaya made a successful comeback in the 1999–2000 season. In December 1999, she defeated Butyrskaya, the reigning World champion, to win her first Russian national title. The following month, she won the Grand Prix Final, defeating both Butyrskaya and Kwan. In second place behind Kwan ahead of the two-women "super final," Slutskaya landed seven triples in the final segment, including two triple-triple combinations, and became the first woman to perform a 3Lz-3Lo combination in competition. In February, she won her third European title, in Vienna, Austria. At the 2000 World Championships in Nice, France, Slutskaya won her qualifying pool over Kwan and placed second to Butyrskaya in the short program. She completed six triples in the free skating, with a 2S instead of her planned 3S-3Lo, and finished second overall behind Kwan. Slutskaya began the 2000–01 season in dominant fashion. After defeating Kwan to win Skate Canada International, she took her fourth European title, in January 2001 in Bratislava, and then defended her Grand Prix Final title, in February in Tokyo. After winning the short program at the 2001 World Championships, in the free skating, she became the first woman to land a 3S-3Lo-2T combination. She two-footed her 3Lz-3Lo-2T combination and had problems on two other landings. The judges voted 7–2 to award the gold medal to Kwan while silver went to Slutskaya. In the 2001–02 season, Slutskaya won all five of her meetings with Kwan, however, she also saw a new challenge from the 2001 World bronze medalist, Sarah Hughes. After winning her first Goodwill Games title, she finished second to Hughes at Skate Canada International and then took gold at Cup of Russia. At the Grand Prix Final, Slutskaya performed well to win the first two segments of the event, but her second free skating contained only three clean triples. Three judges placed her third behind Kwan and Hughes but four others placed her first, giving Slutskaya her third GPF title. She then took her third straight Russian national title but lost her European title to Maria Butyrskaya. Third in the short program after a fall, she placed first in the free skating but it was not enough to overcome her deficit. Slutskaya's next event was the 2002 Winter Olympics in Salt Lake City. Kwan and Slutskaya were ranked first and second in the short program, with Cohen and Hughes placing third and fourth, respectively. After Kwan finished below Hughes in the overall standings, Slutskaya had to place first in the free skating in order to win gold but Hughes won the free skating in a 5–4 decision. Hughes performed seven triples and two triple-triple combinations, while Slutskaya did not attempt any triple-triples and had rough landings on two jumps. Russia, still somewhat aggrieved about the outcome of an earlier dispute over the pairs competition, filed a complaint against the result but it was rejected shortly. Slutskaya's silver was the second medal for a Russian competitor in an Olympic ladies' figure skating event (Kira Ivanova took bronze at the 1984 Olympics). Later, Russian businessman and politician Anton Bakov awarded Irina a "consolation" custom gold medal completely made of 700 grams of gold. The next month, Slutskaya won the 2002 World title in Nagano. Ranked first in both the qualifying round and the short program, followed by Fumie Suguri and Michelle Kwan, in theory Slutskaya could place second to Kwan in the free skating and still win the title but she won a majority of the judges' votes in the segment. It was her first World title. In the 2002–03 season, Slutskaya took silver at the 2002 NHK Trophy and bronze at the 2002 Cup of Russia before losing her national title to Elena Sokolova at the Russian Championships in December 2002. In January 2003, she defeated Sokolova to win her fifth European title in Malmö. The following month, she took silver at the Grand Prix Final in Saint Petersburg after placing first in one segment and second to Sasha Cohen in the other two. Slutskaya decided not to compete at the 2003 World Championships after receiving news that her mother had fallen seriously ill, requiring a kidney transplant. The initial transplant was rejected and another one had to be performed. Soon after her mother's condition began improving, however, Slutskaya experienced severe fatigue and swelling in the legs, which several hospitals struggled to correctly diagnose. She missed most of the 2003–04 season. Although doctors told her that she should stay away from the cold, she elected to compete at the 2004 World Championships and finished ninth. She was diagnosed ultimately with vasculitis. On 19 January 2006, Slutskaya won the European Championships for the seventh time, breaking the record she had shared with Sonja Henie and Katarina Witt to become the most successful ladies' skater at the event. At the 2006 Winter Olympics in Turin, Italy, Slutskaya was considered the odds on favorite to win the gold medal — 15-year-old Mao Asada, who had upset her at that season's Grand Prix Final, was barred from the event due to age regulations. She was in second place after the short program by only 0.03, behind Sasha Cohen of the United States. In the free skating, Slutskaya doubled a triple flip and then fell on a triple loop jump. She won the bronze medal, behind gold medalist Shizuka Arakawa of Japan and silver medalist Cohen. Slutskaya did not compete at the 2006 World Championships the following month. She originally not planned on competing at the 2006 worlds in Calgary, Alberta, Canada, but decided before the event she would like to compete and vye for a 3rd world title, unfortunately her entry request was deemed too late and she was disallowed to compete. In November 2006, she denied reports that claimed she was retiring from competitive figure skating, saying the reports were completely false. Despite the claims she has not competed since the 2006 Torino Olympics so it seems clear she had in fact retired, but had not yet wanted to make it public. On 10 April 2007, Slutskaya announced she was returning to Russia from the United States and would not participate on the 2007 Champions on Ice tour since she and her husband, Sergei, were expecting a child. Slutskaya stated that she enjoyed motherhood and had no plans to return to competitive skating. "I don’t see the target," she said. "I don’t know why I have to go there. I have almost all the titles." She began a career in showbusiness. She presented figure skating reality shows on Russia Channel 1 "Stars on Ice" with co-host Evgeni Plushenko and "Ice Age" with actor Marat Basharov. She has also released a CD. In 2008, she took part in a Russian TV soap opera about figure skating "Hot Ice". She also toured as the lead skater in the Russian version of the show "Winx on Ice". In November 2008, Slutskaya performed in the "Skate from the Heart" show. In 2009, she was inducted into the International Jewish Sports Hall of Fame. In 2011, Slutskaya also participated in 2010 Winter Olympic champion Yuna Kim ice show All That Skate Summer. In October 2012, Slutskaya competed in the first Medal Winner's Open, an event for Olympic and World medalists. She placed third in the ladies' field. She was an ambassador for the 2014 Winter Olympics in Sochi, Russia. Slutskaya was born in 1979 in Moscow, Russian SFSR, Soviet Union, the only child of a Russian mother and Jewish father. Slutskaya was raised in the Russian Orthodox faith and was known to cross herself in most of her competitions. Her mother was a former cross-country skier for the Soviet Union. Slutskaya married her boyfriend, Sergei Mikheev, in August 1999. They met each other three years earlier at a summer camp near Moscow, where Mikheev was a physical education instructor. She gave birth to a son, Artem, in November 2007 in Moscow. An only child who longed for siblings, she said she would like another baby. In October 2010, she gave birth to their second child, a daughter named Varvara. Record holder for most Grand Prix Final titles won by a woman. Record later tied by Mao Asada. ^ Rymer, Thomas (26 November 1999). "Russians get near sweep of women's and pairs". Associated Press. CBS Sportsline. ^ a b Lisitsyn, Lina (2 March 2009). Ирина Слуцкая: «Семья всегда была дороже титулов» [Irina Slutskaya: "Family has always been more valuable than titles"] (in Russian). yagazeta.com. Archived from the original on 18 July 2011. Retrieved 3 September 2010. ^ Ирина Слуцкая, недавно излечившаяся от серьезной болезни, может снова попасть в больницу [Irina Slutskaya, has recently been cured of serious illness, may again be placed in the hospital] (in Russian). izvestia.ru. 15 January 2004. Archived from the original on 7 April 2008. ^ "Slutskaya Is Savoring New Phase of Her Life". Associated Press. The New York Times. 22 November 2008. ^ Ирина Слуцкая штурмует музыкальный Олимп [Irina Slutskaya stormed musical Olympus] (in Russian). NTV.ru. 12 April 2006. Archived from the original on 1 February 2011. ^ Жаркий лед [Hot Ice] (in Russian). 2008. Archived from the original on 23 June 2013. ^ "Jewish Sports Hall of Fame: Elected members Irina Slutskaya". Jewishsports.net. Retrieved 4 January 2011. ^ "Japan hosts three star-studded events this week". IceNetwork.com. October 2012. ^ "Japan Open 2012 and Open Medal Winner, stars in world race". ArtOnIce.it (in Italian). 10 October 2012. ^ Castellaro, Barbara (26 October 2012). "Irina Slutskaya "I ricordi mi hanno portata da Nagano a Sochi"" [Irina Slutskaya interview]. ArtOnIce.it (in Italian). ^ Eden, Ami. "How Gold Medalist Sarah Hughes Skated under the "Jewish Radar"". Forward.com. Interfaith Family. ^ a b "Ирина СЛУЦКАЯ, cемикратная чемпионка Европы по фигурному катанию: Недоброжелатели предрекали мне бездетный брак" [European champion in figure skating: detractors had predicted I would have a childless marriage] (in Russian). Komsomolskaya Pravda. 22 November 2007. Retrieved 22 November 2010. ^ Ирина Слуцкая во второй раз стала мамой [Irina Slutskaya for the second time became a mother] (in Russian). Lifenews.ru. 22 November 2010. Retrieved 22 November 2010. ^ Paderina, Ksenia (26 November 2010). Ирина Слуцкая: "Я попросила хирурга развернуть монитор и увидела, как рождается мой ребенок" [Irina Slutskaya: "I asked the surgean to turn the monitor and watched the birth of my child"]. Теленеделя (Москва) (in Russian). Archived from the original on 3 December 2010. Retrieved 1 December 2010. ^ Likhacheva, Polina (26 June 2013). Ирина Слуцкая: «Материнство — это слезы радости, перемешанные с усталостью» [Irina Slutskaya: "Motherhood is tears of joy mixed with fatigue] (in Russian). Deti.mail.ru. ^ a b "Competition Results: Irina SLUTSKAYA". International Skating Union. Archived from the original on 2 January 2014. ^ "Слуцкая Ирина Эдуардовна". fskate.ru (in Russian). This page is based on the Wikipedia article Irina Slutskaya; it is used under the Creative Commons Attribution-ShareAlike 3.0 Unported License (CC-BY-SA). You may redistribute it, verbatim or modified, providing that you comply with the terms of the CC-BY-SA.